I received a lovely surprise this past Saturday on my way to our Columbus blogger get-together. 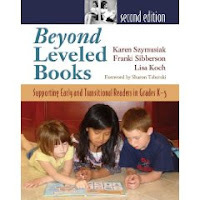 I received the second edition of Karen Szymusiak and Franki Sibberson's Beyond Leveled Books: Supporting Early and Transitional Readers in Grades K - 5. The first edition of Beyond Leveled Books came out in 2001; it hardly seems possible that 7 years have gone by! At the time I read their first book, I was enthralled with what Karen and Franki had to say about how important it is to support transitional readers by matching them with good books. And, believe or not, the second edition is jam-packed with even more ideas and suggestions about how to do this same thing!! I spent several hours poring over the format of Beyond Leveled Books (Second Edition). The introduction to this book will knock your socks off. It is titled, "My Son Clark Kent", by Lisa Koch (also a contributing author for the second edition of Beyond Leveled Books). I first read this article on the Choice Literacy website. I believe this piece about Koch's son, Alec, is a must read for every reading teacher in the world!! Just as important, it is the perfect introduction for the theme of this book -- let's look at more than just leveled books when we're trying to match a reader with a book. Let's get to know our readers as more than just a level number or letter. Another great addition to this edition are the guest author pieces. Karen, Franki, and Lisa have included articles within each chapter to support their thinking. These articles are written by people who know what they are talking about when it comes to children's literature -- Diane DeFord, Andria Klein, Lynn Salem, Josie Stewart, Katie DiCesare, Larry Swartz, Kathy Collins, Loren Long, Mary Lee Hahn, and Shari Frost. These articles flow so well with the topic already being discussed in the chapter. For example, in chapter 3, "Understanding Transitional Readers", there is an article written by Larry Swartz titled "Is There Life After Captain Underpants? Fiction for Transitional Boy Readers". If you are a fan of the appendixes that have been included in other books by Franki and Karen, you will not be disappointed. The appendix in the latest Beyond Leveled Books is full of the latest forms these ladies have found work best with children. The cover is even delightful -- it shows the black and white photo from the first edition at the top, and then at the bottom is a colored photo of three children enjoying a Scaredy Squirrel book. There's a certain symmetry to all of it. I've been a big fan of Franki and Karen for years. I am fortunate to be able to call them colleagues and friends. What they have done for children's literacy in the past 7 years with the books they have published is just amazing. Their latest edition of Beyond Leveled Books (along with Lisa Koch) should belong to all teachers of reading. Put Beyond Leveled Readers on your "to buy" list -- it is due out October 17, 2008. We are honored to be *hearted* by A Year Of Reading. 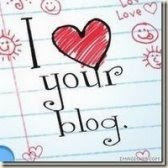 We're going to pass the honor and love to some blogs we really enjoy (we realize some of them may be repeat *hearts*). This is the big weekend of the Kidlitosphere Conference in Portland, Oregon. Since I knew I wouldn't be able to make it to Oregon this weekend, some bloggers in the Columbus area decided to show our support for this conference by gathering together in the area to talk about our lives, books, and blogs. At last count, there are currently eleven bloggers that we are aware of in the Columbus area (if there are more, please let us know so that we can include you in our next get together!). Of those eleven, seven of us were able to attend the get-together. We started at NorthStar Cafe, one of our favorite eating places, for breakfast. As you look at the picture, going around the table from bottom left to bottom right, are Franki from A Year of Reading; me; Megan (all the way from Dayton) from Read, Read, Read; Bill, my blogging partner here at Literate Lives; Mary Lee from A Year of Reading; and Stella from My World - Mi Mundo. Through a miscommunication from yours truly, Kristine from Best Book I Have Not Read was sitting at the NorthStar Cafe in another part of town. Luckily, we did meet her when we went to our next stop! If you look carefully at the picture, you will see that we supported the Portland conference by buying some of the t-shirts and coffee mugs that were offered. What you don't can't see in the picture are all the conversations we had as we either caught up with each other's lives or got to know new blogging friends! After a delicious breakfast, we headed south on High Street to our second gathering spot -- our favorite independent children's bookstore -- Cover to Cover. At Cover to Cover, we finally connected with Kristine (all the way from Granville and in the green in the picture below). Also, the owner, Sally Oddi, had gathered some ARCs for us to browse through. I was able to get Wendy Mass's (Jeremy Fink and the Meaning of Life) newest book, 11 Birthdays. It is due out in January 2009. Being a huge fan of Jeremy Fink, I was more than a little excited about this find! While at the store, we wandered around and browsed, calling out to each other great finds and encouraging each other to "take a look at this one! ", or handing someone a book and saying, "what do you think?" We all started to gather our piles an d gravitate toward the story steps in the back of the store to winnow out the best choices we had made and needed to purchase today. You know what I mean -- those "I've got to have it!" books. So, was this just a day for meeting for breakfast and buying books? I don't think so. For me, it's far more than that. The Friday night before our little Columbus get-together, my husband and I went out with friends to play golf and have dinner. While we were at dinner, we started talking about what everyone had planned for Saturday, and I shared that I was meeting some blogger friends in the morning. They weren't sure what blogging was, so I went on to explain that my blogger friends are people who love children's books and then like to write reviews of books they read, and also read reviews that other bloggers write. The man was a little incredulous. I even explained how, since we couldn't make it to Portland, that we were having a mini-kidlit blogging meeting here. I think what really threw him was that I gave the gathering a name -- kidlitosphere conference. What I realized from this encounter is that trying to explain why I love to read kidlit blogs, and why I so enjoy sharing a blog with Bill, is almost impossible to someone who doesn't have that mind set. I'm okay with that. Even my husband, who's incredibly supportive of me as a teacher and a blogger, doesn't really understand why it's so meaningful to me. I feel so fortunate to share this passion for children's books with all other kidlit bloggers and all the people who stop in to read what we write!! I am passionate about getting good books into kids' hands on a daily basis, and I feel so very fortunate to have found a place where others feel the same. Together, we all form a community -- bloggers, blog readers, authors, and the children who read the books. It is a community in which I am proud to be a part!! Thanks to the organizers of the kidlitosphere conference in Portland, and to all the Columbus bloggers who energize me through your blogs on a regular basis! Ellie McDoodle is Back and it's GOOD! I read the first Ellie McDoodle Have Pen Will Travel at about the same time as the Wimpy Kid frenzy hit our school. I was looking for a girl alternative and liked it pretty well. It wasn't as funny as Wimpy kid, but the drawings were good and there were some funny parts, but I just couldn't get it to fly off the shelves like the Wimpy kid. Having just finished the second Ellie McDoodle New Kid in School, I think I can get it to move. Ruth McNally Barshaw has really taken Ellie places in this installment. In the first, there seemed to be too much direction on how to play games, make friends, create crafty things, in other words, like Mary Lee said, "It was just an instruction manual on how to be a kid." I liked it but it didn't have the kid appeal. 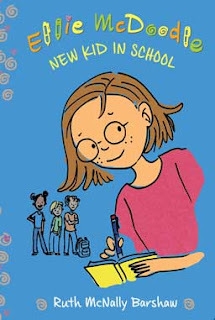 In New Kid in School, the author deals with the hardships faced by a student who has to leave the only home she has ever known, and move to a new town a couple of hours away. Ellie goes through all of the typical separation anxiety missing her friends, her room, her neighborhood and her school. She is worried about what the new kids will think of her, and it's even tougher since she mov es to a small school where all of the students seem to be related to one another. Thanks to a friendly children's librarian Ellie finds a comfortable safe place to get away from the craziness of moving. Thanks to a neighborhood boy she makes a first friend who helps her make even more. I especially like it that there is not "romance" involved, just a good friendship written in age appropriate terms. I really like that Barshaw doesn't make the first girl to approach Ellie work out to her lifelong best friend forever. In fact, the visit is boring and Ellie looks for a reason to escape early. On a second visit to another classmate, Ellie is impressed with the material things, fancy house, fancy clothes, and any THING a kid could want, but realizes that it's just not comfortable for her. The third classmate that invites Ellie over has a normal family with a Down Syndrome brother who develops a crush on her. At first Ellie is a bit uncomfortable with this, but as time goes on she learns that this is a good friend and a great family. Ellie leads a protest in school against long lunch lines and bad food that get her recognized as a leader and friend. The book may have bit of a "storybook" ending, but not too cheesey, and I liked it. The drawings are very fun, especially the one of Ellie's classroom view from the back row when she is wondering how she will ever learn to know people when all she sees is the backs of their heads. I'm pretty sure this book will move pretty easily in the library to both 4th and 5th graders. Like Wimpy Kid, it will appeal to both boys and girls. Look to Quill Inc. for another review and The Reading Zone here. 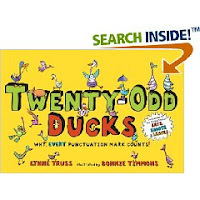 Lynne Truss has done it again -- she has added to her punctuation books with her latest, Twenty-Odd Ducks: Why, EVERY Punctuation Mark Counts! This latest punctuation adventure doesn't disappoint. "Our ancient-history teacher went to Egypt. Our ancient history teacher went to Egypt." The illustrations by Bonnie Timmons just help add to the fun of the text meaning. If you enjoyed the original, Eats, Shoots & Leaves, you're bound to enjoy Twenty-Odd Ducks, also. This book will be joining my "Fun With Language" tub tomorrow!! It is such a great visual for kids to help them understand the importance of correct punctuation usage! The Diamond of Darkhold is a Gem!! Well, in my neck of the woods, because of high winds that led to massive power outages, I've had quite a bit of time to read lately. In the beginning of a school year, adding reading to my "to do" list can be difficult, so I'm considering these power outages and school closings a small gift that allows me to get caught up on my "to read" pile. One of the books in that pile was The Diamond of Darkhold, the 4th in a series of books by Jeanne DuPrau, that started with The City of Ember. I had really wanted to read this book for a couple of reasons: 1) I loved The City of Ember when I first read it and could hardly put it down, 2) I had the opportunity to hear Jeanne DuPrau speak two years ago at the Dublin Literacy Conference, and I loved hearing her talk about where the idea for this group of books came from, 3) I knew The City of Ember movie was coming out Oct. 10, 2008 (see trailer and countdown to movie), and 4) The City of Ember is the read aloud I will be starting next with my class (if I ever get back to school!). So, yesterday, I sat down with the book mid-afternoon, and only stopping for dinner and a friend stopping by, I finished The Diamond of Darkhold by 8:30 last night. It gave me the same feeling I had the first time I read The City of Ember -- I just couldn't put it down because of the plot turns and twists. It was truly engaging from first sentence to last sentence. I read Franki's post at A Year of Reading about this book, and I couldn't agree with her more -- this book brings closure to a lot of questions I had about what would happen to Lina and Doon and a variety of other supporting characters last seen in People of Sparks. I closed the book feeling very satisfied with the ending. I will not include any spoilers in this post, because if you've been a fan of the books that came before -- The City of Ember, People of Sparks, and Prophet of Yonwood (a prequel, and by the way, my least favorite of all the books) -- I don't want to ruin for you the experience that I believe The Diamond of Darkhold will give. I will say, however, that even the title brings closure -- after you read this book, I'd love to have you leave a comment and let me know what you think about the title, especially the last word. 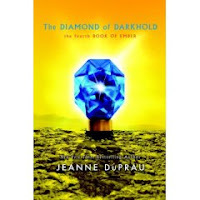 With that said, I encourage you to run out and find this book at your nearest library or bookstore, and read it -- The Diamond of Darkhold truly is a gem!! I love Clementine, Junie B. Jones and Moxy Maxwell. I laugh out loud at all of their adventures. I recommend them to all of my first through third grade readers, and also to my older readers who just like a quick, fun read. Now, I have a series that I can recommend that features a boy character. 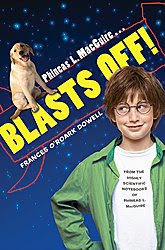 Phineas Listerman MacGuire, Mac, Big Mac, Phin, or Phineas, but never Listerman is a fourth grade science freak! He loves science, all kinds of science, and raises slime mold in his bedroom. His best friends are Aretha, an over achiever, class president who has dreams of being the best Girl Scout ever in the history of their school and Ben, the gifted artist who creates comics and in this episode, a video. In the third installment Phineas is obsessed with going to Space Camp and is looking for ways to make money. The first opportunity involves walking Lemon Drop, the biggest yellow lab in the history of the world. Phineas is amazed at the amount of drool that a dog creates and his scientific mind begins to race. Ben video tapes as Phin and Aretha collect dog saliva for a series of experiments. Author Francis O'Roark Dowell (Shooting the Moon) creates fun characters and puts them in some hilarious situations. One of my favorite characters is Mrs. McClosky, Lemon Drop's owner. According to Phineas she is approximately eight thousand years old but still has a pretty good arm for throwing a slobbery tennis ball. I love the interaction between her and the children. Mrs. McClosky calls them all by the wrong names, names that are close in sound to the real thing, but never quite right. The children NEVER correct her! I love that they accept that this is part of her and we don't have precocious children correcting her in a disrespectful tone. I'm very excited to have a series for the younger readers that features a boy, and I'm even more excited that it's written by a quality author like Francis O'Roark Dowell. If you have not read Shooting the Moon yet, I strongly encourage you to move it to the top of your pile, you won't be disappointed, and if you are looking for a "boy"series, pick up Phineas L. MacGuire, you won't be disappointed there either. I waited a long time to get Savvy by Ingrid Law from the library, and then it sat on my to read pile so long that I had to renew it. Finally I got around to reading it, and when I finished it took me a couple of weeks to realize how much I like it. Savvy is a coming of age story with a really cool twist. The story revolves around Mibs Beaumont who is about to turn 13. Thirteen is tough enough for those of us that experience it in the normal, puberty, voice changing, pimple faced way, but for a Beaumont, turning 13 means that you get your "savvy." For Mibs, one brother, Fish, can create storms, so they can't live near the ocean or hurricanes will blow. Another brother, Rocket, is filled with electrical charge which the family takes advantage of to start the car, but it also causes lights to explode and the power to go out in town. Her mother's savvy is to be perfect in all that she says and does, even if it means to be perfectly wrong, and her grandfather can literally move the ground under their feet. Another brother, Samson, is too young for a savvy, but seems to have a controlling effect on those with their powers. Obviously, the Beaumont children have a tough time being at school after the age of 13 and are home schooled. Mibs has a hard time getting along with the other students and can't wait to turn thirteen so she can get her savvy and stay home with her mother. As in most coming of age, teen angst novels, girls are mean! Mibs puts up with the finger pointing and whispering about her unusual family. In order to keep the children socialized, the family attends church where the preacher's daughter, Roberta, torments Mibs while having a crush on her electrical brother. The preacher's son, Will Junior, has a crush on Mibs, and both of the preacher's kids suspect there is something really special about the Beaumont kids but they can't quite put their fingers on it. The kids end up on an adventure together when Mibs runs away to visit her father in the hospital, convinced that her savvy will be able to cure him. Relationships develop on the big pink school bus and the preacher's kids come to understand that while the Beaumont children are special, under it all, they are just kids. I really like the way Law deals with differences in the story. She uses fantastic, mystical powers to set the Beaumont kids apart, but it could just as easily be skin color, or economic class, or any number of things that make kids different from those around them. Ingrid Law allows the reader to see the world of growing up through both sides' eyes, and develops the characters so well that the reader forgets that we are dealing with the fantasy world. She has created the Beaumont children in such a way that their powers are believable. As I said while I read the book I liked it, but as I thought about it over a few days, I realized just how powerful it is on many levels. I'm thinking this will make a great selection for our second Grand Discussion, and I am putting it on my Newbery short list. I like it a lot. Veteran's Day is exactly 2 months from today, and I'd like to recommend the perfect picture book to share with children that day. 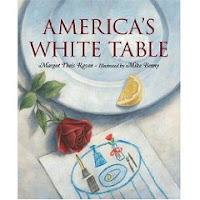 America's White Table by Margot Theis Raven was actually recommended to me by a colleague. I read it and loved it! This book is a perfect tribute to Veterans of all wars. It deals with a tradition I had never heard of before -- setting a little table for one -- the table setting includes a white tablecloth, a lemon slice, grains of salt on a plate, a black napkin, a white candle, a red rose in a vase tied with a red ribbon, an overturned glass, and an empty chair. Each of these parts represents something we need to remember as we think about veterans, POWs, and soldiers who are MIAs. A family is setting a table in honor of their Uncle John who had served in Vietnam. The fact that it is told in the first person by the little girl in the family, really adds to the effectiveness of the story. As they set the table, she is explaining to us what her mother tells her that each part of the place setting means. Then, interspersed throughout the story, the mother in the story tells a little about Uncle John's experience in Vietnam. It is enough to convey the seriousness of war, but not enough to unduly scare or worry children. "It was just a little white table..."
And, each time after that phrase, it then goes on to explain even more about the table. In addition, the words from "My Country 'Tis of Thee" scroll across every other double-page spread. This enhances the feeling of patriotism this book already has. Finally, in the back is an author's note that explains more in depth the history of the white table. I really loved America's White Table! It is a book well-worth sharing with children on Veteran's Day. My friend Mary Lee at A Year of Reading has long been a fan of the graphic novel, and has been bugging me to give them a try. She even suggested many titles, and I've always been hesitant to read them. I guess I can't get past getting in trouble for reading Archie and Friends or MAD Magazine in school. You all remember when teachers didn't consider that "real" reading. I guess I'm a product of my times, but just like stretching myself to read more fantasy since I took over as librarian, I knew that the genre wasn't going away, in fact it's growing like crazy. So, my sense of responsibility took over and I began reading the graphic novel reviews in School Library Journal. I found two so far that I like and will most likely be adding to our library. The question is how do I shelve them, in their own section, or with the other fiction. It's a question that I go back and forth on over and over. Any help you can give would be appreciated, wh at do you think? The first is the beginning of a series called Knights of the Lunch Table: The Dodgeball Chronicles by Frank Cammuso. The title alone made this one appealing to me! Artie King is the new kid in school and in order to fit in he makes some wild claims about his dodgeball skills which get he and his misfit friends into some trouble. The book is filled with King Arthur references, from a locker that can only be opened by the true of heart, to the name of the middle school, Camelot. Artie's favorite teacher that seems to be oh so wise and full of advice is Mr. Merlyn and the list goes on. It would make a fun classroom activity to challenge students to read King Arthur and see how many references they can come up with. I like the story line of this one, the new kid getting into trouble, struggling to fit in and the humor of this graphic novel actually had me laughing out loud in some places. I know kids are going to love this one, and I can't wait for the next in the series. Be sure to read the author intro at the end of the book, very funny. The second graphic novel was totally different, Wild Ride: A Graphic Guide Adventure has a non-fiction aspect to it which I kind of liked. Wild Ride by Liam O'Donnell involves a group of kids in the wilderness. They are flying to meet their parents, environmentalists working to protect the wilds of British Columbia. Following a plane crash they are forced to survive in the wilderness. It is at this point that the non-fiction kicks in. Survival tips such as what to pack in a wilderness survival kit, basic first aid, how to use a signal mirror, and other safety tips are included. While stranded, the kids find themselves in the company of an unscrupulous government worker with plans to foil their parents' environmental studies in order to collect a bribe from the logging company. The illustrations by Mike Deas are darker than I like, giving the book a much more serious somber tone even though the author tries to add some humor. As I read, I was reminded of the Boys' Life magazines I used to read in which one of my favorite features was a comic about real life heroes. I see on Liam Donnell's website that the second Graphic Guide Adventure will be out shortly and involves skate boarding. Well, Mary Lee, I've taken the plunge, keep sending me those graphic novel titles! It's been a while since I've had a chance to post anything new, but I'm excited to be back on a Non Fiction Monday with a book that I think is very cool! When I saw that the book is produced by the Smithsonian I knew that it would be good. The book answers twenty or so questions about the White House from who designed it to how first families relax in the White House. The questions are answered in easy to understand language, appropriate for second grade and up. Younger students will enjoy the pictures of the family pets, bowling alley and movie theater. Several articles include web sites that kids can access to gain further information. For example, there is a Smithsonian link www.npg.si.edu/exh/gw/lands.htm that takes readers to a portrait similar to the one that Dolly Madison saved. The link is included in the article that answers the question "Why did the White House burn?" I'll be able to use this feature in the library when teaching internet research and how to use it to extend information. Another feature that I liked is the interview with the White House Curator, William G. Allman. The interview consists of 12 questions that only the curator could answer including information on his job and "insider" information on living in the White House. 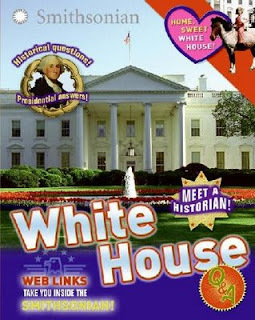 The book also includes more websites to visit and a list of other titles that will enhance a student's learning about our presidents' residence. As we get closer to electing the next resident of "the people's house" kids will enjoy finding out more about 1600 Pennsylvania Avenue. More Non Fiction Monday at Picture Book of the Day. So, I'm at school today, checking my email, and I see that I have received an email from James Preller. That's right, James Preller, of the Jigsaw Jones mystery series fame, and most recently, the author of Six Innings and Along Came Spider. I'm so excited -- James Preller has emailed little ol' me!! ** I feel the need to give a little background at this point. I was fortunate enough to read an ARC of Along Came Spider in June, and then reviewed it because I loved it so much. Somehow, my review caught James Preller's attention, and he blogged about my review here. After that, I started to read his blog on a regular basis, and I realized how much I enjoyed him as both an author and a person. Anyway, back to his email today. It turns out it wasn't just addressed to me; there were 19 other recipients. But what he's asked us all to do is check out this new thing he's doing on his blog -- talking about the process of writing. His post on Friday really focused on leads -- he gave some wonderful examples, and then discussed them a little. If you get a chance, check it out. I'd love to see any kind of reaction in the comments section -- from students especially. Or an email. If you find it worthwhile, please feel free to pass this note & link along to other book-loving teachers. Essentially, now that summer is over, I'm trying to deliver more "writing process" content to make it school-friendly and possibly even instructional. I'd like it to be more interactive, that's for sure, because it's hard to escape the sense of talking in an empty room. " So, there you have it. Getting that email just made my day, but I think the idea here is that James Preller would like more of you to stop by for a visit of his new thinking, also. It sounds like a fabulous opportunity to have interaction with an author!! And what wonderful, real-life applications for students!